Image Copyright © Steve Mansfield-Devine. All rights reserved. Plus Registry 01-AA-660. 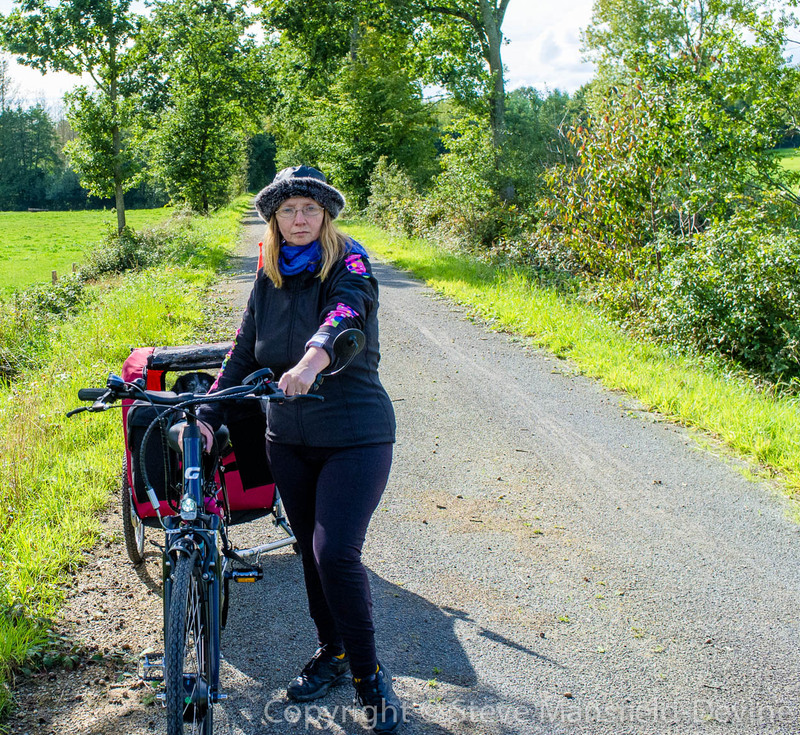 Our trip down the vélo francette last Wednesday was truly lovely. It was such a beautiful September day – 19 degrees, dry and sunny. As Steve mentioned, I was towing Zola and because of that I found myself using the assist more than normal. The slight upward gradient of the old railway line was quite noticeable when towing a 15kg trailer with a 20kg dog in it, as well as panniers with a litre of water, dog food and snacks for us, and spare bits n bobs. I had decided to wear actual cycle kit for the first time outside the house, even though I felt a bit of a dork. I’ll be reviewing the garments more thoroughly later, but suffice it to say that my Sheila Moon winter tights and hooded cycling jacket both performed fantastically well. I find it really comfortable to wear proper cycling tights rather than trousers that swish and are noisy and get in the way of the pedals or chain, and the cycling jacket is snug, and doesn’t flap around the place. Underneath I wore my usual merino Eddy tee (I live in these), and on my feet were summer weight mohair socks from Corrymoor and New Balance trainers. The hat is a padded waterproof from Brittany with fur trim. I was cosy and warm but not hot and sweaty and the only thing I really lacked was some sunglasses – I hadn’t allowed for how dazzling the sun would be on the way back. Riding on the e-bike doesn’t raise much of a sweat, really and in any case, much of the route was shady and cool. From time to time I turned off the assist just to work out for half a click or so, then turned it back on again for easy riding. The difference when Zola was let out of the Doggyhut was also noticeable, although on this day he seemed more tired than last time and was quite content to ride along in his carriage for most of the 12-13km we achieved, gently resting his nose on his paws. As Steve mentioned in his blog, there are frequent barriers across the greenway and at these I found it wisest to dismount completely and push the bike through. On one of the rare occasions I decided to try to ride through, I nearly put the Doggyhut in a ditch. The ground at the sides of the barriers is very muddy because it’s not tarmac’ed and the length of the bike, pole and hut made it a bit too difficult to steer. The greenway was a bit busier than our local one, which runs through countryside rather than near villages, and every time we saw someone else, we stopped and held the dog until the people went by. This is a gesture generally appreciated by other cyclists in particular. Cézanne is a lovely friendly dog but no-one wants a mutt running round their wheels when they’re trying to keep their balance. Overall, I am really pleased with how adept we’re becoming at getting the bikes on and off the rack, kitting up and setting out. It’s not much of a palaver at all and should be even easier now we’ve bought the optional (and very overpriced) removal ramp for the Thule rack.